While you stand in the scrum attempting to catch the bar-staff’s attention, you try and rearrange your face into a warm, ‘pick me’ kind of a gaze. Getting annoyed won’t work (unless you’re from a particularly lofty pedigree, i.e. you’re old enough to have known founder Giancarlo Linari and you probably baby-sat him a few times). So you raise your eyebrows and smile like a loon, flourishing your receipt and hoisting your elbows onto the glass counter to create just enough space for a couple of saucers. When you do get served, those saucers are clattered carelessly in front of you to show you have booked your place in the coffee queue. Then you have to wave and point, or expertly name, your pastry of choice. 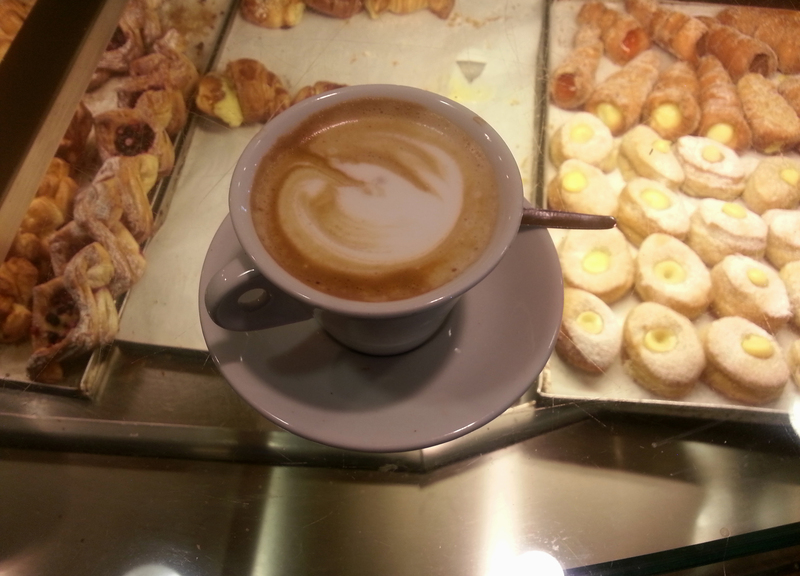 The coffee’s good here, but let’s be clear, you come for the cornetto, which is the de rigueur expression in Rome for any kind of breakfast pastry, which you’d probably have to describe as a brioche in Milan to avoid confusion. Linari makes its own in a tiny enclosed space confined by the triangular back walls of the bar. 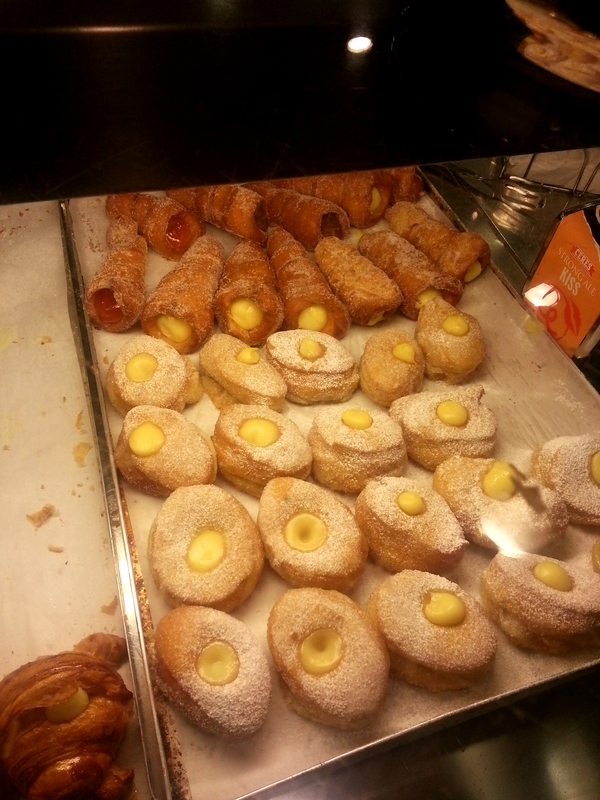 There are ciambelle, large, loose golden hoops of fried doughnut, coated with sugar; bombe fritte, filled doughnuts oozing with custard, jam or Nutella. A Danese – a Danish – is a buttery disc with sugar sprinkles and chocolate drops, or fruits of the forest; a girella, a spiral of soft dough studded with sultanas, featuring a great, glassy eye of apricot jam in the middle. 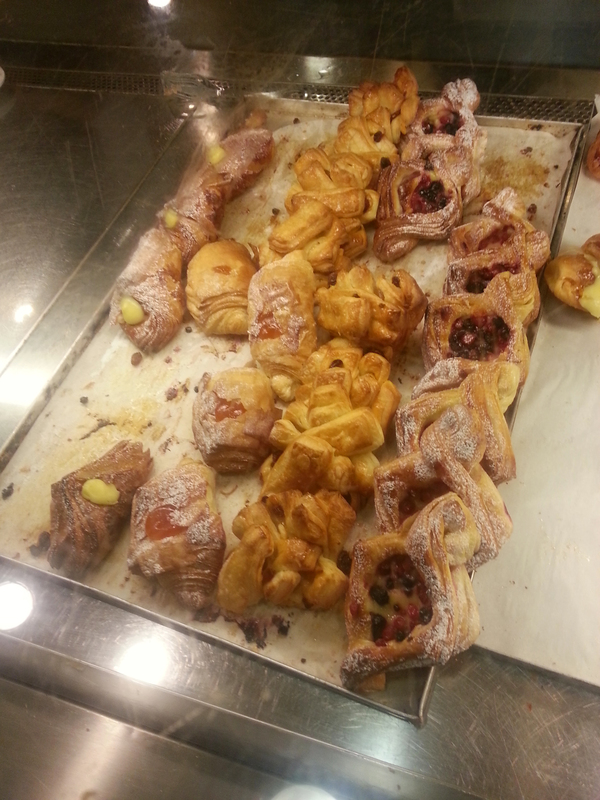 There are also plaited pastries, or trecce, as well as fazzoletti, little folded handkerchiefs of flaky pastry. You can of course order a conventional cornetto, a buttery twist of dough, with or without a sweet filling, distinguished from their croissants, which tend to be slightly denser and more rigid. There’s always some maverick ordering pizza in the morning; Linari is also famous for its pizzette, saucer-sized discs of tangy tomato paste on a thin, supple base, with or without mozzarella. A couple of years ago, Linari also started to offer a tavola calda at lunch, which is a good value, limited menu consisting of first and second courses, or pizza by the slice. There are also fritti and suppli, deep-fried courgette flowers and baccalà or rice balls coated in amber bread-crumbs. And that’s only half the story. Linari is a pasticceria in the true Roman tradition, with a fridge full of party cakes and a long counter with mignon and full-sized Italian pastries and desserts, ranging from Sicilian specialities like cannoli and cassate to single bite éclairs, fruit-glazed tartlets, or handmade chocolates. There are panettoni and pandori at Christmas, voile and foil-covered eggs at Easter, and a cake for every occasion in between. In the evenings, there’s a decent buffet for a good-value aperitivo, €5 all inclusive for a glass of prosecco and a plateful of sausage rolls, tiny pizzas, bruschette and fried nuggets. Linari has stood on this spot since 1971, when Giancarlo and his wife Enrica opened a small pasticceria here, after learning their trade in another bakery in Garbatella. Business flourished and they soon had to take over the space next door as well. These days, the business is run by Giancarlo and Enrica’s four children, Simona, Lorena, Enrico and Fabio, who usually sit at the cash register and welcome the daily flow of traffic. The cake is good. The pizzas are mouthwatering. But to sample the true Linari experience, you have to come for breakfast.